Leg lifters are designed to help individuals lift their legs in and out of bed, while also providing support getting into wheelchairs, cars and even bathtubs (Source). One of our favorites is the Norco (North Coast Medical) leg lifter. North Coast Medical says that is designed to help people who have had total hip replacement surgeries and individuals suffering from limited mobility to lower and raise their legs. Additionally, some users have reported using their lifters to help them perform certain physical rehabilitation movements, essentially extending their range of motion to get 'more' out of their home rehab routines. Besides general mobility impairments, this leg assistance device can also be helpful for disabled people and those who suffer from hip arthritis or weak hip flexors. The way it is designed, the lifter itself is covered with an inch nylon webbing to be soft on your extremities. The 9-inch looping foot hold will bend easily and is large enough to accommodate any size foot or cast, letting you fit your foot into it and securely maneuver your leg. The aluminum rod measures 30" and the total length of the item, including its hand strap, measures 40"
One physical therapist we spoke to had high praise for Norco, saying that it is one of the premier resources for physical rehabilitation products. He was particularly impressed that the leg lifter had a rigid loop, saying that many of them have ineffectual, flimsy strapping. Because of its strong design, it is able to easily lift heavy legs, and in effect is a highly useful assistive device. Another elderly buyer who had recently had a hip surgery began using this product to help lift her legs in and out of bed- finding it indispensable for that purpose. In all, it's the best of the bunch that we took a look at. Let's check out 5 of the other best-selling leg-lifters on the market. This leg lifting tool offered by Norco is well-designed, easy-to-use and suitable for people with limited limb mobility. Users love the price, but some do note that it’s hard to place their foot in it properly. The Norco lifter is made of durable aluminum, and it’s covered in 1-inch wide soft nylon webbing. There is also a 9-inch loop foothold that easily bends to accommodate your foot and a hand strap. The total length of this lift assisting device is 40 inches (30-inch aluminum rod plus 10-inch hand strap). A buyer shares his professional opinion as a therapist that the Norco lifter is the best lifting assistance device available. The reviewer states that it has a rigid loop that can easily accommodate any foot and that the custom support is exceptional. Another happy user mentions that this strap lifter is very useful for getting in and out of a car and that he feels more independent since he has it. A satisfied user also comments that this is a necessity for anyone who had leg surgery and that the loop is rigid but comfortable. However, some customers have complained that it was too difficult for them to use this foot lifter and that it’s not very well-constructed. A user also complained that his lifting rod lasted only two months before it broke. This navy leg lifting tool offered by Kinsman is reliable, comfortable and an excellent choice for people with hip replacement surgery. Users love that this lifter is easy to use, but some do note that they expected something different. The Kinsman navy leg lifter has reinforced webbing with a metal rod, a foot loop that can be easily adjusted, a weight of 1.6 ounces and shipping dimensions 41 L x 8 W x 4 H inches. Overall, this is a cheap navy leg lifter suitable for anyone that has troubles lifting his leg. In general, buyers have a high opinion of the Kinsman navy leg lifting strap, and they praise its effectiveness and reliability. A user comments that this bed leg lifter is a necessity after foot surgery and that it’s very easy to use it. The reviewer also states that his foot fits comfortably and securely. Another satisfied customer mentions that he uses this lifter to stretch every day and that it’s ideal for physical therapy. A happy client also shares that the navy leg lifting device was delivered quickly and that metal rod feels solid and stable. However, some customers have complained that the product description is incorrect and the foot lifter they received was missing the metal rod. A user complains that he got only the strap and that he felt cheated and deceived. 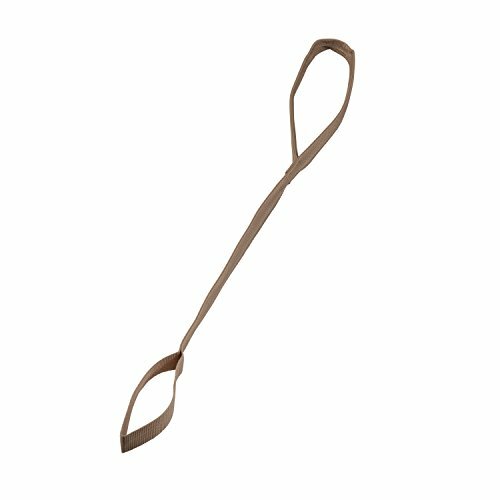 If you are looking for a solid leg lifter to help you get out of beds or cars, you might want to take a look at this beige leg lifting strap offered by Duro-Med. Users love the length and the lightweight construction, but some do note that it’s not as easy to control the lifter as they expected. This leg lifting tool has a durable aluminum construction covered with 1-inch nylon webbing, large open loops at each end, and a length of 32 inches. As a whole, this is a well-made leg lifter that can be of great assistance to anyone with mobility issues. In general, users are satisfied with the beige leg strap, and they praise its design, durability, and usefulness. A buyer comments that this bed leg lifter helps him to relax his leg and to move it around with minimal efforts. The reviewer recommends it to anyone with hip problems and advises that you should practice with the lifter before your surgery. A happy user mentions that it’s a piece of cake to slip your foot in the strap and that this is the best leg lifter available. The reviewer also states the leg lifter is long, comfortable and well-made and that even though he uses it daily, the leg lifting strap doesn’t show signs of wearing out. However, some customers have complained that this leg lifter strap is flimsy and that the stitching is poorly done. A user complains that the rod bends too easily and that it’s was hard for him to place his foot inside the loop. If you are searching for a top-rated loop strap, you might take a look at the Drive Medical lifestyle lifter. Users love the durable construction, but some do note that it’s expensive. This medical foot lifting strap has a total length of 36 inches, a width of 1 inch, a weight of 0.3 ounces, and it made of durable polypropylene. There is a hand and a foot strap to make it easier for you to get in and out of bed, and it’s also suitable for physical therapy. As a whole, users are extremely satisfied with the functionality and design of the Drive Medical lifting strap, and they don’t have any major complaints regarding its performance. A buyer shares that this lifter made his life easier after his knee surgery and that he could lift his legs on the bed with minimal effort. Another customer mentions that he was very surprised by the usefulness and the durability of this lifter and that it’s a handy tool to have around. He would recommend it to anyone looking for the best lifter available. 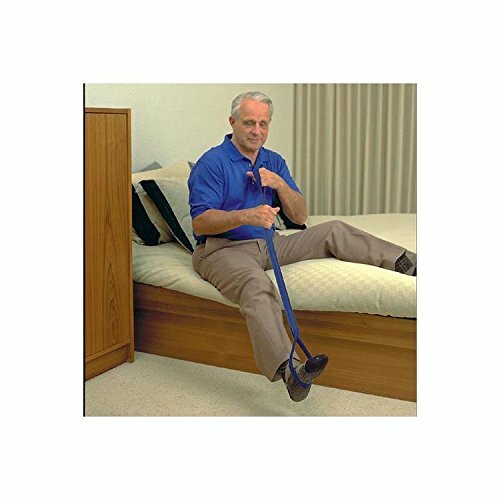 Another happy purchaser states that he has been using this bed leg strap during his physical therapy and that it’s perfect for non-weight-bearing stretches. However, the user has complained that the rubber grip is slightly uncomfortable and he would have preferred something softer. This blue medical leg lift strap offered by Sammons Preston is well-made, reliable, stable and convenient. Users love that this foot lifter is comfortable and easy-to-use, but some do note that they had problems to fit their foot in it. This blue rigid leg lifter has a total length of 40 inches, a metal rod with reinforced webbing, a foot loop that you can pre-bend to accommodate your foot, and a flexible hand loop for additional comfort. The foot loop has a rubber grip so that you don’t have to worry that your food will slide out of the strap. In general, users are pleased with the usefulness and the performance of the Sammons blue foot lifter. A buyer comments that he was skeptical whether this leg strap lifter would be helpful and that he only regrets not buying it sooner. The reviewer states that he uses the lifter regularly without any complaints and that he is considering buying a second one for his car. The purchaser would recommend this leg lifting strap to anyone needs a high-grade leg lifter. Another customer mentions that he has big feet and the strap fits him with no issues. The user also says that the strap is stiff and sturdy, so it’s very easy to put his foot in it. However, some customers have complained that the rubber gripper inside the leg loop is uncomfortable, especially for bare feet. Some users also note that this leg lifter didn’t work for them and they were disappointed with their purchase. One Norco reviewer that we spoke with had recently undergone a knee replacement surgery and said that this medical lift strap was essential to him getting in and out of his car to go to work in the morning. It was a handy complement to the physical therapy sessions that he was also doing. Whenever he had to do rehabilitative heel slides, he was able to utilize the lifter to extend the range of motion of the exercise. Another reviewer said that they are caretakers for a paralyzed relative- because this person is paralyzed from the waist down, it is extremely difficult for them to move their feet and legs. They purchased this lifter and described it as a life-saving assistive device- it enables individuals suffering from paralysis to adjust their limbs when they are in bed to get more comfortable, to get in and out of bed, and even to help position their feet and legs when they are settling into a wheelchair. Another option that we took a look at was the Kinsman leg lifter. This particular leg lifter is reinforced with a metal rod, designed to help extend an individual's reach when they are lifting one leg at a time. There seems to be some confusion surrounding this product. Some elderly users who purchased it said that it did not include the metal rod so, for this reason, we would be a little bit wary of this product. The Duro-Med leg lifter strap was another option that we took a look at. The manufacturers say that it is designed to help individuals suffering mobility impairments, recovering from limb surgeries, to get their legs out of chairs, beds, wheelchairs and cars. It has loops at either end, and an aluminum rod covered by an inch of nylon webbing to make it a strong and durable option designed for long-term use. One buyer we spoke with says that after they had undergone hip replacement surgery, they were sure to keep this particular lifter beside their bed so that they could easily get in and out. Without using the lifter, this purchaser told us that it was incredibly painful and nearly impossible to lift the leg post-surgery. An interesting bit of advice this reviewer had was that they recommended practicing using the lifter before you undergo the surgery so that you are familiar with how to use it. Another buyer we spoke with described it as long enough to be able to reach your foot and because it is firm on one end it's easy to slip on over shoes and casts. However, one buyer we interviewed told us that they had trouble getting into their car wearing their shoes because the rubber soles would catch. In her case, it would've been better to have a rigid, stirrup loop at one end. The Drive Medical leg lifter was another option we examined- the manufacturers say that it is an easy way to help mobility impaired individuals lift their legs. It is a simple means for positioning your leg when you are in bed or seated, utilizing durable hand and foot loops. One buyer we interviewed said this was a solid value buy that, in their opinion, is a durable option for people suffering from knee and back problems. In addition, on this reviewer speaks of using it for non-weight-bearing leg stretches, saying that it is a handy exercise tool to increase the efficacy of their physical rehabilitation exercises. Because the stirrup is stiff with its plastic support, some reviewers advised wearing socks or shoes when you are using it for exercise purposes. Another buyer who favors wearing tennis shoes said that it was an easy solution for her to get in and out of her car, saying that the ends of the product easily fit over her sneakers. The last option we looked at was the Sammons Preston rigid leg lifter with its flexible rubber foot grip. The manufactures describe it as containing a metal rod in the center and foot portions of the lifter, reinforced with a flexible webbing. One buyer we spoke with says that initially they were a little bit skeptical about purchasing it, but ever since they received it they have been using it on a daily basis to get in and out of the bathtub, navigate the perils of entering into their car, and of course getting in and out of their bed in the evening. They also advised novice users to potentially purchase more than one of these like lifters- you can store one in the car, and keep one by the bed, for example. The rigid bottom provides strong stability for sneakers and bare feet, but it doesn't cut into the side of the foot, either. Another reviewer who is a caretaker for an elderly relative says that because her patient has an arthritic knee and her physical therapist had advised purchasing one of these lifters to facilitate transfer into bed. This assistive device has in effect helped her senior citizen relative maintain independent living because she is able to manage the movements herself. These range of motion straps help individuals and even paraplegics to independently perform range of motion movements with their lower extremities. If you or a loved one suffer from a limited range of motion, these handy mobility aids can be an essential tool in your arsenal.